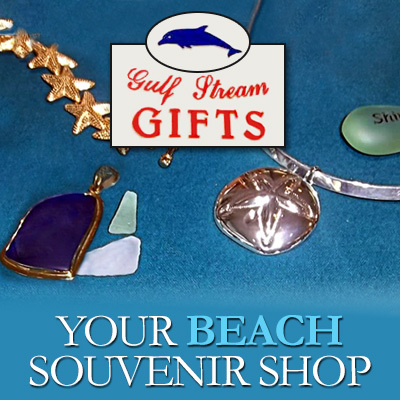 Gulf Stream Gifts in Nags Head Outer Banks offers a great variety of fashion jewelry, as well as 14K gold and sterling silver jewelry. A fun place to shop for tourists, the store’s inventory includes nautical and sea-themed souvenirs, mermaid items, fish and crab décor, seagull art and very pretty glass dolphins and shells. There are also T-shirts, wind chimes, greeting cards, postcards, OBX items, and even a selection of sunglasses, towels and sunblock --- so you can pick up some gifts, then dash across the street to the beach! Many of our customers call us "different' or "unique" because we are not a chain store. We have been in the same location since 1987, each year with fresh ideas and merchandise. Gulf Stream Gifts' friendly and experienced staff is here to assist you in any way we can. Stop in and say hello to Tom, Marge, Sharon, Chris, or Kim, we all love to see you again or meet you for the first time. Enjoy the Outer Banks.